Imagining Wenzhou – How can we use the Internet to introduce readers to unfamiliar cities? In 2006, American adman Dan Ligon shared a video, “Ha Ha Ha America”, that he’d entered in the Sundance film festival. The video presents itself as an angry and dismissive rant about China’s superiority and America’s inferiority, badly subtitled in Chinglish. I wrote about the film when it came out, troubled by the racism associated with the Chinglish narration, and my fear it would be misread as reality, not satire, by American audiences. The Shanghaiist and some other China-based commentators were similarly troubled, though one Daily Kos reader found it a helpful wakeup call about China’s rise and America’s failure to compete economically. 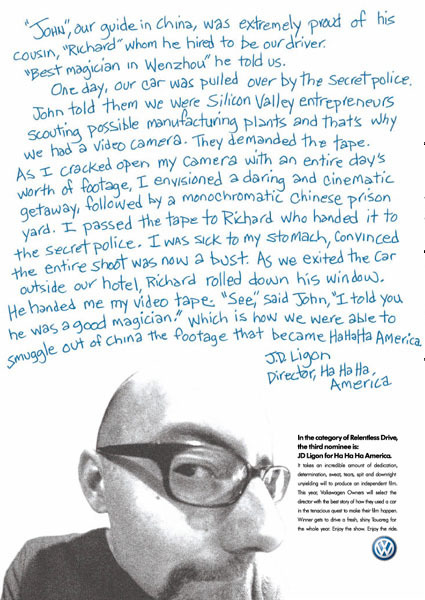 A story about shooting Ha Ha Ha America, from Ligon’s site. The film is shot in Wenzhou, and central to its narrative is the idea that Wenzhou, China’s 16th largest city, is likely to surpass New York City in population soon. This requires some blurring of the numbers – the Wenzhou jurisdiction, which includes two satellite cities and six counties, has a population of about 9 million, though only 3 million live in the city proper. New York City has an urban population of over 8 million and 20 million in the broader metropolitan area. Ligon’s comparison is apples to oranges (metropolitan area to urban population), but it’s a provocative idea that a city most Americans had never heard of could rival the population of America’s largest cities. What interested me about Ligon’s film was the juxtaposition of a narrative about China’s rise with the images of a cityscape that isn’t going to challenge New York City for tourists any time soon. If Ligon’s argument is that size matters, then perhaps discovering that a massive city that reads visually as a somewhat sleepy provincial capital tells us that a future of Chinese megacities is going to look very different from the European/American 20th century. Or perhaps there’s a subtler message that size isn’t everything, and that iconic, aspirational cities occupy another conceptual space entirely. I was thinking about “Ha Ha Ha America” because I realize I don’t have a very clear picture of what Chinese cities look like. I’ve recently been to Guangzhou and Hong Kong, and in the more distant past, to Beijing, but it’s very hard for me to picture what I think Wenzhou would look like. I’ve been thinking about Chinese cities because my colleague Catherine d’Ignazio is working on a project called Terra Incognita, an online game that tracks your reading about different cities and invites you to explore readings about unfamiliar parts of the world. The project is a reaction, in part, to my writings about homophily and serendipity. By helping you monitor your reading behavior, Terra Incognita can reveal your blind spots, and then help you find ways to explore content from those unknown parts of the world. Catherine’s current implementation of Terra Incognita uses a browser plugin to track your reading (only on a whitelisted set of news sites) and opens a portal to one of the world’s 1000 largest cities when you open a new tab. Should you read a lot about Europe, you won’t get a page on Berlin, but might get Brazzaville, which could include a piece from my blog about Congolese sapeurs. That we’re relying on this blog as a source of compelling content designed to help you explore unfamiliar places is an indicator of the main problem with the project: it’s hard to find compelling readings on many of the world’s cities. This problem is especially acute for China. Roughly 40% of the cities on the list Catherine is working from are in mainland China, and it’s not always easy to find English-language readings that introduce what’s exciting or special about a city to an international audience. Exploring this idea, I found Peter Hessler’s article for National Geographic, “China’s Instant Cities”. Hessler explores the growth of Lishui, a rapidly growing manufacturing city 80 kilometers from Wenzhou through the story of Boss Gao, a Wenzhouese entrepreneur who builds a factory to build bra underwires and rings (the wire rings that bra clasps hook into.) It’s a brilliant story, featured in a collection of 2008’s best magazine writing, and it did exactly what I hope Terra Incognita can do: help readers develop an interest in places they knew nothing about. (I’m now using magportal.com, a magazine search engine, to look for other Wenzhou articles, like Stephen Glain’s article in Smithsonian magazine, “A Tale of Two Chinas”, which contrasts entrepreneurial Wenzhou with Shenyang, a former government stronghold now facing hard times. As I was writing “Rewire”, I had a helpful and long-running argument with David Weinberger, who worried that my hopes of engineering serendipity by tracking what we read, identifying blind spots and making suggestions would be less effective than a much simpler strategy – just read a really good magazine. The promise of Granta, The New Yorker or other elite magazines is simple: it doesn’t matter if you’re interested in the topic, because the writing is so good it will draw you in. David’s right that quality matters. But I wonder if the magazine format is the key issue. Introducing someone to your community via news stories doesn’t work, as they lack context to understand the news. An encyclopedia article offers background, but no seduction, no reason to read and explore. Magazine articles need to draw you in and to expose you to the unfamiliar, and can’t assume as much context. Part of the success of Terra Incognita may rest on whether we can find these sorts of high quality, low context stories for a thousand cities. Incomplete? Yes. Biased? Indeed. But if you’re interested in learning more either about Wenzhou or Pittsfield, perhaps Catherine is on to something. Catherine and I would love your help on Terra Incognita – please sign up for the alpha site here, and if you have specific suggestions of stories to represent a city, please use this form. I’d also welcome general thoughts on how we should be looking for great stories linked to global cities. One Response to Imagining Wenzhou – How can we use the Internet to introduce readers to unfamiliar cities?